I've acquired a new-to-me 2004 Vectra that I'm trying to set up for towing. The Owners Manual says there was a supplied "connector plug" which came with the coach. I did not get this part when I took delivery. I do have the 7-pin connector back by the hitch. Question: I've been all over the Winne site, looked through the parts catalog etc. Can't find it to order. Is this needed? I'm looking at a Roadmaster tow dolly (as sold by C-World and others) as I cannot go 4-down. Do these dollys require the pigtail or do they have the 7-pin wiring already? Sorry for the newbie question; am 4 yrs into Class A but just moved up to the DP and haven't towed before. If you are looking for the 7-pin plug to a 4 or 6 pin plug that connects to the toad, CW sells them. The plug your manual is referring to is just the standard 7 pin trailer plug, available at any auto parts store. When I had the towbar and baseplate installed on my Saturn, the package included the complete wiring needed, therefore I didn't need the plug that came with the mh. I gave it to a friend who had broken his. Thanks guys. That clears things up a lot! You can get the plugs and adapters at Wally World also. Don't forget "blocking diodes" for your toad. This will prevent any feedback to the coach. Lastly be aware that most 7 blade receptacles combine the turn ans brake lights on the same pin. So, if you have separate turn and stop lights on you toad wiring can get complex. Here is want Newmar provides. 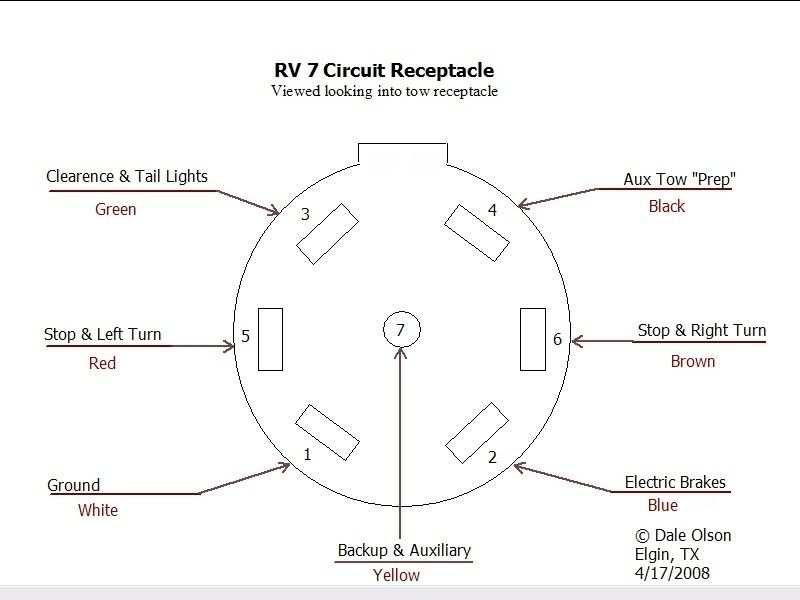 Be aware that pins 2, 4, and 7 are run from the dash area to the receptacle but are NOT connected to any power source. The owner can use them as they see fit. Our Roadmaster dolly came with all the wiring including a 7 pin plug that matched the socket on the rear of our motorhome. However the socket on the rear of our coach did not have the blue wire for the brakes hooked up. It was folded back in the harness leading to the socket about 4 feet from the rear of the coach. I had to remove it from the harness, add a few feet of #10 wire and plug it into the rear of the socket. Hikerdogs brings up a good point. If you get a dolly with electric brakes, you'll need an electric brake controller below the dash to hook up to that blue wire. If you get a dolly with surge brakes, the blue wire is irrelevant. Thanks everyone for all the info. Much appreciated. Thanks for the note about looking for the blue wire. I'd assumed it was already connected but I'll take a look at the cable near the hitch. We towed our Buick LeSabre over 25,000 miles on the Roadmaster with electric brakes without any problems. The LeSabre was just replaced with an 08 Lucerne. So far with less than 1,000 miles on the clock we haven't towed it anywhere but probably will this summer. All Winnebago chassis are "prewired for towing". All that really means is there's a plug under the dash that will accept a connection from a brake controller and a trailer hitch socket in the rear. You'll still need a jumper harness from whatever brand controller you buy (we use a Tekonsha Prodigy) to the connection under the dash. The jumper harnesses are specific to a brand and model controller and a chassis type. Meaning you'll need a jumper for a Prodigy (if you choose that brand & model) to an 05 Freightliner chassis. As for the brake wire in the trailer socket it may or may not be attached. When I realized we still had no brakes on the dolly after I installed the controller I went searching for the wire as the chassis was supposed to be "prewired for towing". When I found it I called the dealer and asked why it wasn't connected. The reply was "they all come from the factory without the brake wire connected to the trailer hitch socket. We only connect it if someone informs us they intend to tow a trailer with electric brakes". Its like being "prewired" for the CB and satellite dish. Everything you need is there. You just have to know where to find it.